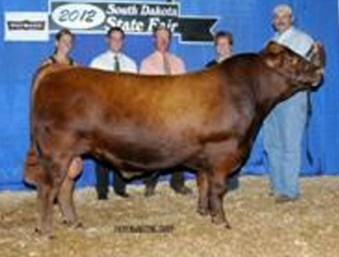 “We have been using the BioZyme products on all of our show and sale cattle since last summer. We actually just used Sure Champ on our show cattle at first but were so happy with the results we noticed in them that we decided to start using VitaFerm on all of our sale cattle as well. We travel across the states from Iowa to Texas and from Louisville to Denver marketing our cattle and for us it is extremely important that the cattle maintain their appetite and stay healthy no matter where they go. Before we leave for an event all the cattle get Vita Charge to keep their system working while traveling down the road. For our sale in the fall we send 50 heifers to Oklahoma to market them. Before they leave, they all get Vita Charge and once we get there they are go straight to the bunk to eat. The next morning we had one heifer calf that had gotten into some bad weeds overnight. We had the vet come out to take a look at her and to our surprise he pulled out Vita Charge and gave her another dose of that. By the next day she was back in full force.